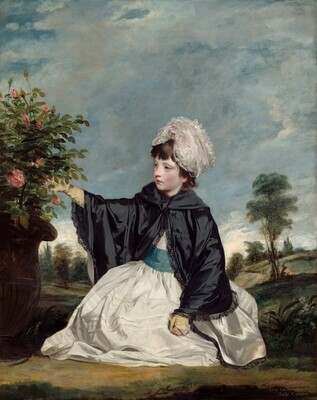 Lady Caroline Howard, daughter of Frederick, the fifth Earl of Carlisle, and Margaret Caroline Howard, and niece of Lady Delmé, was portrayed by Reynolds at the age of seven. Reynolds deliberately imposed on his compositions certain formal artistic qualities that would give them the solidity and nobility of Greek, Roman, and Renaissance art. He also liked to suggest associations in his portraits that elevate them to some level beyond the merely descriptive. Roses are symbolically related to Venus and the Three Graces, and Reynolds may well have intended to allude to their attributes, Chastity, Beauty, and Love, as ideals to which Lady Caroline should aspire. Lady Caroline's father affectionately described his daughter as a determined, strong-minded child whose need for discipline he met fairly but reluctantly. He wrote that she was "always a great favorite," suggesting that her spirited personality made her faults tolerable. Reynolds captured some of Lady Caroline's complexity in the serious, intent expression of her attractive face, her averted gaze, and the tension implied in her closed left hand. by another later hand, lower right : Lady Caroline Howard / Lady Cawdor. Painted for the sitter's father, Frederick Howard, 5th earl of Carlisle [1748-1825], Castle Howard, Yorkshire; by descent to the Hon. Geoffrey Howard [1877-1935], son of George, 9th earl of Carlisle, who sold it February 1926 to (Duveen Brothers, Inc., London and New York); purchased 3 February 1926 by Andrew W. Mellon, Pittsburgh and Washington, D.C.; deeded December 1934 to The A.W. Mellon Educational and Charitable Trust, Pittsburgh; gift 1937 to NGA. The addition of the 7th Earl of Carlisle to Ownership Detail below is per NGA curatorial files. Royal Academy of Arts, London, 1779, no. 252, as A young lady. Pictures of the Italian, Spanish, Flemish, Dutch and English Schools, British Institution, London, 1824, no. 162. Pictures of the Italian, Spanish, Flemish, Dutch, French, and English Masters, British Institution, London, 1851, no. 118. Ancient and Modern, Irish Institution, Dublin, 1856, no. 20. British Art, Royal Academy of Arts, London, 1934, no. 315 (commemorative catalogue, 1935, no. 145, pl. 45). Reynolds, Royal Academy of Arts, London, 1986, no. 107, color repro. The medium-lightweight canvas is loosely plain woven; it has been lined. The ground is pinkish white, very thinly applied. The painting is broadly and fluidly executed in thick, opaque layers, with thin translucent glazes in the background. Underlying brushstrokes and an x-radiograph show that the composition has been modified slightly from an underpainted design: the blue sash, for example, was originally broader. There is moderate abrasion in the glazed shadows of the face and in the thinly applied green paint of the trees, and areas of impasto have been slightly flattened during lining. There is some retouching in the face. The medium thick natural resin varnish has discolored yellow to a moderate degree. St. James's Chronicle, 24-27 April 1779. Leslie, Charles Robert and Tom Taylor. Life and Times of Sir Joshua Reynolds. 2 vols. London, 1865: 2:427. Graves, Algernon and William Vine Cronin. A History of the Works of Sir Joshua Reynolds. 4 vols. London, 1899-1901: 2:487-488. Armstrong, Sir Walter. Sir Joshua Reynolds. London, 1900: 213. Duveen Brothers. Duveen Pictures in Public Collections of America. New York, 1941: nos. 266-267, repros. Preliminary Catalogue of Paintings and Sculpture. National Gallery of Art, Washington, 1941: 167-168, no. 106, pl. X.
Waterhouse, Sir Ellis. Reynolds. London, 1941: 70, pl. 211. Book of Illustrations. National Gallery of Art, Washington, 1942: 241, repro. 18. Cairns, Huntington, and John Walker, eds. Masterpieces of Painting from the National Gallery of Art. New York, 1944: 132, color repro. Paintings and Sculpture from the Mellon Collection. National Gallery of Art, Washington, 1949 (reprinted 1953 and 1958): 107, repro. King, Marian. Portfolio Number 3. National Gallery of Art, Washington, 1951: no. 8, color repro. Walker, John. National Gallery of Art, Washington. New York, 1956: 48, color repro. Cooke, Hereward Lester. British Painting in the National Gallery of Art. Washington, D.C., 1960 (Booklet Number Eight in Ten Schools of Painting in the National Gallery of Art, Washington, D.C.): 14, color repro. Walker, John. National Gallery of Art, Washington, D.C. New York, 1963 (reprinted 1964 in French, German, and Spanish): 220, repro. Summary Catalogue of European Paintings and Sculpture. National Gallery of Art, Washington, 1965: 113. Cairns, Huntington, and John Walker, eds. A Pageant of Painting from the National Gallery of Art. 2 vols. New York, 1966: 2:348, color repro. European Paintings and Sculpture, Illustrations. National Gallery of Art, Washington, 1968: 101, repro. European Paintings: An Illustrated Summary Catalogue. National Gallery of Art, Washington, 1975: 302, repro. Walker, John. National Gallery of Art, Washington. New York, 1975: no. 502, color repro. Walker, John. National Gallery of Art, Washington. Rev. ed. New York, 1984: 358, no. 500, color repro. European Paintings: An Illustrated Catalogue. National Gallery of Art, Washington, 1985: 349, repro. Kopper, Philip. America's National Gallery of Art: A Gift to the Nation. New York, 1991: 60, 259, color repro. Hayes, John. British Paintings of the Sixteenth through Nineteenth Centuries. The Collections of the National Gallery of Art Systematic Catalogue. Washington, D.C., 1992: 217-219, color repro. 219. National Gallery of Art. National Gallery of Art, Washington. New York, 1992: 148, repro. Hand, John Oliver. National Gallery of Art: Master Paintings from the Collection. Washington and New York, 2004: 280, no. 226, color repro.